Rayma is a Venezuelan cartoonist who today published a panel which has pissed off the Opposition in Venezuela, the side she is on. People are dying while the politicos from both side are playing their games in the country and abroad. And the People will not do squat because fighting for Freedom and killing the oppressor has been tattooed in their brains as immoral and not worthy of a true Democracy. Any “freedom” must be achieved without violence or it becomes impure. International help (Food and medicines) is arriving to the border town of Cucuta in Colombia to be delivered in Venezuela. What has been the response of the Venezuelan Government? Block the border access. 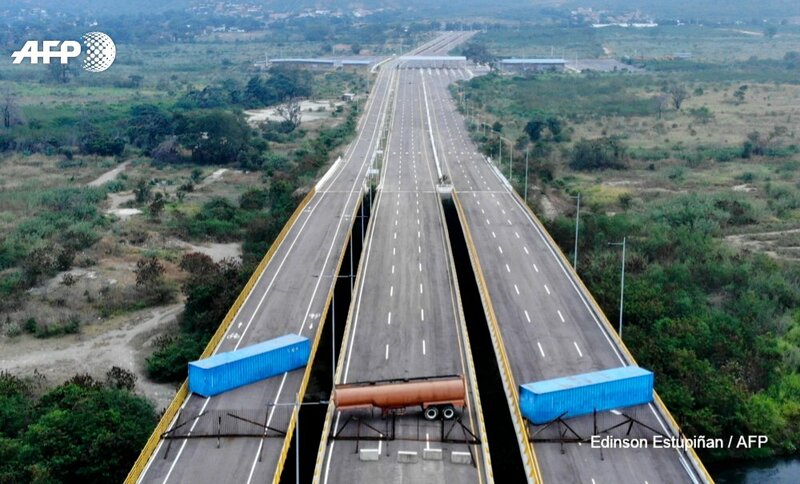 Venezuelan troops have barricaded a bridge on the country’s western border with Colombia in an apparent attempt to prevent the entry of humanitarian aid sent by opposition leaders trying to force Nicolas Maduro from power. The Opposition probably issued a strongly worded criticisms and perhaps planned on another meeting with the proper NGOs out there so they can come to an agreement to issue a formal letter of complain, strongly worded, of course. In the meantime, people will continue to die from starvation and sickness, but always maintaining the high moral ground of non-violence which surely will bring freedom this time. Well, death is a form of freedom, right? That barrier looks like something a bulldozer could remove in 5 minutes. Just push those things into the river and continue on. Yes, I guess they have not just been disarmed but disballed. I suspect there’s more than one border crossing point that stuff is getting through, that the army know about, but is getting a fat cut for not knowing about it. Smuggler routes? Yes they exist, but those are inefficient ways plus you really want to have smugglers going through your stuff? . Even there, I’m being rather generous in assuming that anything is actually getting to people not connected. It’s more likely everything coming in is going to the friends and families of the army, or is being resold at inflated prices by the army. Underneath every single tyranny, you will also find massive corruption. I have no doubt that Maduro’s cronies and minions are working it to the hilt, especially those eyeing the likely need to get out of the nation at a moment’s notice.